You didn't put your bike away already did you? The kids are back in school, the RV traffic has lightened on the roads and there are some wonderful weather days ahead for riding. While some think the last weekend in September is "put your bike away until spring" time, we say hogwash. Those that do so are missing some of the best riding days of the year. 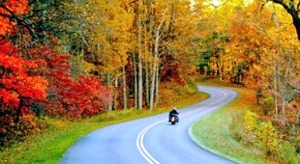 Over the years, experience has taught us a lot about riding in the fall. Here's 10 tips to keep you riding into October and possibly even into November. Go for the high country - In the Puget Sound where I live, there are a lot of low elevation rides to take. But we could take those rides just about any day of the year. At the start of the fall, the snow hasn't found its way into the mountains yet, so incorporating a few passes into the mix is perfect right now. Bring layers - you can get away without wearing much during a summer ride, but be sure to pack the layers even if it's warm when you're ready to take off. Weather has a way of changing abruptly. A base layer, your gear liner and rain gear all add a layer of warmth when you need it. Get wired - Beyond the usual base layer and liner, heated gear, hand grips and heated seats add the kind of warmth you'll relish on a cold fall morning. Incorporate one or more into your arsenal. If you already have such, be sure it's working before you go. Check the weather - Personally speaking, I don't always do a good job of looking at the advance weather and thus I've been caught up in torrential downpours, high winds and snow. A little advance planning might cause a re-route for you, keeping you out of the wicked stuff. And no matter how hard you research, you may still get caught by surprise, so be ready. Check those tires - My m.o. is to take off for a week or longer during the fall. But if I've been riding the same bike all summer, those tires might be looking a tad thin. If I'm out for a week, 6/32's of tread won't take me far. If your tread is on it's last legs, it might be a good idea to change tires before leaving, or schedule some to be waiting for you out on your route. Wildlife abounds - There's a lot of wildlife moving around during the fall. Incorporate a little viewing into your adventure by picking out a place or two where you might come across it and pack a camera to snap a few pics as you go. No hurries, no worries - It seems like summer rides incorporate a lot of go-go-go into them with some riders packing in the high mileage every day. It's time to relax, take stock in what's around you and just enjoy the journey at a slower pace. Pocket kites fly really well at this time of year. Plan, no plan - I know meticulous riders who plan a trip right down to where they're going to have lunch each day. Fall is a good time to just go and make it up as you go without booking advance reservations, never knowing where you might end up one day to the next. Get a room - I like motorcycle camping as much as the next thrifty rider, but the fact is some nights can get darn cold and you might like something a little cozier. Hotels and motels seem the obvious option, but how about a few nights in some state park cabins, or grabbing a cot at a hostel on the route. Seeing the sites - As part of making a fall trip a bit more relaxing, stop into one of those museums you usually blow by, add a little culinary uptick to your ride instead of munching on fast food all day, or park the bike for a day midway and take a site-seeing tour provided by the locals, if such exists along your route. You might also enjoy our suggestions for 10 Fall riding destinations in the Pacific Northwest.